Now this game is the complete opposite of Flight Simulator. Obviously. Cary reminded me of it the other day. It's for the Atari, and I played a ton of it. Basically you're Snoopy on his doghouse battling the Red Baron. Doesn't get more simple than that. For some reason, I remember playing this in my kitchen in Delaware when I was a kid. I guess we had connected the Atari in there so my mom could watch me while she was cooking and whatnot. I don't know. I remember this game being very satisfying and fun, but I'm not sure if I would feel the same way if I played it now. Snoop doggie dooooo -o- oooooog. Snoopy is sipping his gin and juice. I was thinking of Snoopy Flying Ace. They've made 3 Snoopy flying simulators. What a world. I've never heard of either of those games! Snoopy vs. the Red Baron was a PS2 game published by Namco. It was like Ace Combat for kids and was very fun. The people who developed the PS2 game made a game called Snoopy Flying Ace, which was pretty much the same game but online play oriented. Both games are good, but I prefer the PS2 game because I'm not good enough at flight combat games to compete online. Yeah I've played and reviewed both Snoopy vs. the Red Baron (PS2), and Snoopy Flying Ace (360). I prefer the single player nature of the PS2 game because I'm not good enough at flight games to compete online. There's also a Snoopy vs. the Red Baron Christmas song, too! 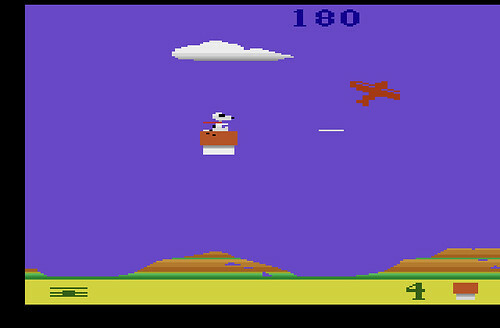 I don't think I've ever played the Atari Snoopy game. Hum. . . I should fix that.